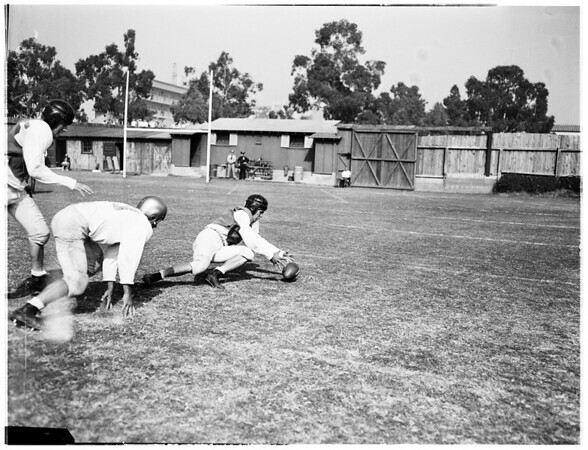 Supplementary material reads: "UCLA Scrimmage. Whites (Varsity) vs Reds (Jarvees). 59: Reds' Cliff Livingston (RE) catches Ray Napel's pass. 10 yard gain. White's Whitney Arceneaux is defender. 58: White's fullback John (Cappy) Smith dives over middle of Red line for T.D. from 3 yards out. 96: Primo Villanueva, Red safety, recovers White fumble. Terry Debay (LE) of Whites also attempting to get loose ball. 97: Paul Cameron (White tailback) (LH) scampers around RE for 35 yd. gain. Pete Dailey (49) (White wingback) (RH) attempts block. 11: Ted Narleski (White tailback) (LH) returns kickoff for 41 yds. Jose Sobol (White wingback) (RH) leads interference. 57: Bob Moore (White tailback) (LH) goes around RE for 5 yds. and TD. 56: Oren Breeland (White RE) makes fingertip catch of a Bob Moore Aerial for 42 yd. gain".